PSA said Punch's dual-clutch design, allowed for fewer components and a lighter and more compact transmission system. PARIS -- PSA Group has accelerated its move into electrification by signing an agreement with the Chinese-Belgian supplier Punch Powertrain to provide electrified dual-clutch transmissions for 48-volt mild hybrid vehicles. 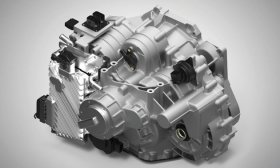 The transmissions, which will appear in PSA vehicles by 2022, will have a 48-volt motor mounted in the so-called P2 position, between an internal combustion engine and the transmission. PSA has set a target of offering electrified versions of 100 percent of its range by 2025. The companies are in discussions about manufacturing the transmissions at a PSA facility, and are exploring the possibility of extending the partnership, according to a news release. In the release, PSA said Punch's dual-clutch design, allowed for fewer components and a lighter and more compact transmission system. Punch is based in Sint-Truiden, Belgium. It was originally a subsidiary of the automaker DAF and was later taken over by ZF. It is now owned by the Yinyi group, which acquired the company in 2016. Punch's main factories in Nanjing, China, and Belgium together produce more than one million transmissions annually. In the past year, it has inaugurated factories in Iran and Ningbo, China. Punch primarily supplies continuously variable transmissions to Asian customers, including BAIC Group, Dongfeng, Geely and Proton. PSA is its first large European customer, said Gert-Jan Vogelaar, director of strategic marketing at Punch. He declined to say the value of the PSA contract. The company is making a major push into electrification, Vogelaar said. The first electrified products will appear this year, including a continuously variable transmission for plug-in hybrids and a full electric powertrain. To support its move into electrification, Punch acquired a French power electronics company, Apojee, in January.